Bags are packed, but what skin shall I put on? So, my bags are packed, and I’m going Alliance! Hoo-boy. Alliance eh. Haven’t done this Alliance thing in ~3 years!!! WOAH! Where are my manners?!? Big thanks to Ceraphus of the Sundering and the guild Phalanx of Nod for welcoming me into their band of bacon scarfing merry miscreants!!! I hope I can bring some good raid dps and capability to their team when I am asked to come in and contribute. Otherwise that bribe of 150 lbs of prime Benton’s Bacon (used by David Chang no less), will have gone to complete waste. So, let us set aside the clear “truth” that Frostheim spouts: Dwarves are best. I have a Dwarf Hunter at level 70 in the WHU on Icecrown already. 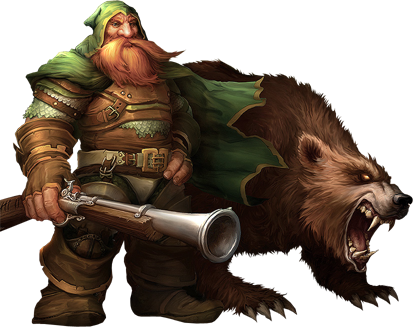 One Dwarf Hunter is more than enough for any one player. I refuse to play a Human Hunter…in fact, I refuse to play ANY Human character. One part of playing in a Fantasy MMO such as WoW is to suspend reality to some extent. Playing a Human just doesn’t help me do that (no offense to those that play humans, its definitely a personal preference thing). Side note: On the Horde side the no-no race is undead. I never play any undead. Why? Because in my book the undead are inherently evil. I like to think the Horde is not evil, merely misunderstood or have a differing albeit opposing perspective to the Alliance. Undead however are EVIL! They are UNDEAD! Somehow I cannot bring myself to think I am nothing more than their next meal. Its like I’m Kramer and they are Newman. I see them licking their chops!!! So, this leaves the choices of Worgen, Night Elf, and Draenei. Draenei do have an increase to hit which is nice for a Hunter, but wholly unnecessary as with current gear choices we are always well over the hit cap. My current WHU Hunter was originally my Night Elf Hunter from Vanilla/BC…so I spent the first 4 years of WoW as a Night Elf. This leaves Worgen….now, from a pure statistical point, they win. 1% crit is quite huge in many ways. I actually have an alt Hunter who is Worgen and is currently level 74, so I have some experience with them, the back story, the racial quirks *sniff sniff*. Its a comfortable decision for me. Your choice would be? And…um…yeah…For the..oops. Go Alliance?! Wait, where’s my battlecry?! WTF do I say now on this faction!! Seems to me I had read about this issue before…OH YEAH, I had! I asked folks in guild if they new the toon name…no one did. I did some research and found their guild history and matched additional names that corresponded and narrowed it down to a reasonable conclusion. Numerous people defended me in g-chat, so I felt a little bit of love from folks which was nice. Here’s the point: Disagreeing on the direction, tact, tone, rules, etc that your RL, GM, officers put forth is fine; however, ensure you are doing the mature thing to have a conversation regarding said disagreement. In other words, get together and discuss it. No screaming & yelling. DISCUSSION! Hey, I don’t like the way you speak to us, can you maybe turn it down a notch! Oh, I didn’t realize that; I certainly can! We aren’t making any progress, what the heck is going on? We’re analyzing the raids and trying to figure it out now. Do you have some suggestions on what we can change? I am not even going to get into the obvious things like speak civilly, use your main to speak (not some alt that no one knows), and be sure to give some practical information and constructive criticism not just “we hate you”. Everyone wants to get better, and no one has all the right answers in their back pocket. Collaboration is the key. Benjamin Franklin said it perfectly, “We must all hang together, or assuredly, we shall all hang separately.” The strongest and best foundation is and will always be that of solidarity. Sappy? Perhaps. But very true. Work together toward one common goal and you will have success. Continue to fight amongst yourselves casting blame, taking credit, and disparaging character; you will assuredly fail. I told my new raid team who may not be the best players, but are for the most part good people who I am beginning to enjoy playing along side…”TRUST! Simply trust us that we are guiding our raid team to a point of success. If you have suggestions or see things that need correcting, let us know. Myself and the co-raid leader Tank are here to help everyone have success. Trust us!” Trust is the hardest thing to establish, but the most powerful tool in building a cohesive team. Sappy? Perhaps. But very true. How do you NOT take it personally? So, there you are…you are playing a dps class, or tank, or healer – whatever. You are knowledgeable about your class. You have the right BiS items, enchants, gems, etc. You are specced appropriately for your particular style/brand (i.e. you play Marksman and are specced correctly as a marksman – like you don’t have points in pathfinding or some stupid asinine move like that). You do alright dps, maybe its not the greatest the world has ever seen, but its comparable to others who are similarly specced/geared. You heal perfectly well. No one thinks you are a bad tank. You get compliments that you are good, that you don’t screw up, that you are fun to play alongside. “Yeah, I don’t know if this will work out.” – Then the app is declined. Wait…WHAT?!? So you now have to read something into this…and really there is only one thing to read into it…NO DPS is better than MY DPS. But that’s RL, not a game. RL has to be far pickier, far more choosey in who they bring in, after all real money is involved. And once someone is in the door, its sometimes very difficult to remove them, HR nightmare anyone? But in the game…well, its easy. /GKICK! And you can tell rather quickly when someone gels with your raid group or not. Was the log dps a little low, perhaps. Bring them in and see what they do real time. Maybe everyone around them is that bad, maybe there was RNG effecting the data, maybe they just had an off night. Perhaps everything else they do is a boon to the guild as a whole? You really don’t know until you give them a shot. The point is, its not difficult to give someone a shot inside the digital world, yet we are more particular and demanding, scrutinizing in far more detail our fellow players than a prospective employer does in the real world?! If a player joins your guild, and he causes the break up of your guild…I am willing to bet there were other issues than said player. If you bring a new associate into your company and they bring an assault rifle to work the first day…well, kind of a bigger problem to face. Why are we all so judgmental and finicky about a VIDEO GAME?!? Its meant to be fun, leisure, entertainment? And yet we treat it as if real life hangs in the balance. How else do you take that? How is that NOT personal? Ok, so I gquit last night. Was it rash, maybe. Was it necessary, yes. Like any player, my ultimate responsibility is to my own happiness and enjoyment of the $15 a month subscription fee I shell out. For the past couple weeks, every time I logged in I was faced with another emergency of epic proportions. A few weeks back we had a mass exodus of people off to form their own guild. Right around then we had a Main tank quit, a new main tank join us, then a main healer depart in anger, and the “new” main tank leave to play another 4 letter MMO permanently. Thanks for the support? Well, maybe they were right. What I know was that I weathered us as a guild beyond the issues above to see us down more content than we had previously, expand our raiding team to include a handful more capable players, and help stabilize our core group and provide a solid foundation for continued in-game success. I know not everyone has liked some of my decisions…asking people to sit is never easy, and no one likes it, but in this guild EVERYONE has to take a turn on the bench. And when the only 2 people who complain are 2 of the very officers suggesting I step down as GM…well, call me paranoid, but I can see a picture getting much much clearer. Well, having one of them snap at me that “no one gives a s*** about what you have to say” regarding a brief conversation with another guild member…well, ok its either they go or I go. The decision was clear with 3 of the officers having expressed previously that I should step back. And honestly…I didn’t feel like anyone was very sad to see me go. There was one “Can we discuss this” but my response was simply “what do you expect me to do?” Can someone be the GM of a guild when the officer core has little or no respect for them? Can someone continue to be a contributing member of a guild when forced out as the GM? The logical conclusion is to simply step away entirely and say, Thank you, but no thank you. A choice had to be made: GM A vs Officer B…Clearly they would choose the later. I don’t know how they will do without me, I suspect nothing will change, but time will tell. Do I regret my decision…yes and no. I could no longer take the disrespect and constant looking over my shoulder, walking on eggshells, and fear of opening my mouth for how it will be construed. One can not effectively lead in that kind of situation. I do regret it coming to this. There were a couple things I could have done differently, they may have been better, perhaps worse. How would you or have you handled this? Have you seen a GM forced out regardless of a guild’s measurable success simply over differences or dislikes?